2 days of yoga, healing arts, mindfulness, body- & breathwork, music, philosophy, dance and live acts – with more than 40 excellent teachers, healers & visionaries! 2 days with workshops, self-reflection, realignment, encounters, stillness – a place of comfort, full of laughter and soulfulness, providing much time and space FOR YOURSELF! ... Enjoy the garden Eden with us, views of lush green, hearts towards the sky. Let your soul swing between touching workshops and deep connections at AGAPE ZOE Berlin Festival No. 19. At the check-in counter at the festival location you can purchase day tickets for 79,- EUR as well as festival tickets for 109,- EUR. Our gathering takes place at a magical spot – in a charming villa amidst a wonderful, lucious garden in the heart of Berlin. Together, we create a vibrant oasis in which you can refuel, get inspired and just let go. For many years, the EDEN has been an true institution when it comes to dance and movement. 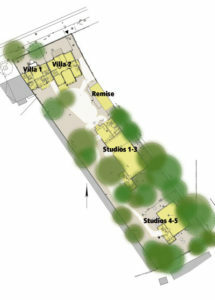 With 5 studios, 2 villas and rooms ranging from 9-300 sq m, the location presents ateliers and production spaces for all branches of the arts which serve as a plattform for new, genre-crossing artistic development and exchange. Movement and a continuous renewal process – initiated by people of different generations, bringing a wide range of topics to the table – interweave and flow through the whole space. They are the reliable, deeply-rooted foundation, providing support in an ever-changing, increasingly busy and confusing world. The AGAPE ZOE weekend festivals spread throughout both the large (300 sq m) studio with floor-to-ceiling windows in the new building and the whole villa. The beautiful old building contains The Good Life Bazaar, the Yoga Room and – nestled quietly on the second floor – rooms for the therapists and healers to offer bodywork and massage sessions. If the weather is kind, the garden area becomes part of the festival.